On a recent trip to the Mojave Desert, I marveled at all the life surviving the harsh conditions. Each plant hangs on stubbornly to its own patch of the sand. The lucky ones get a bit of shade, and they look more lush than their full sun cousins. I imagine there might be some jealous feelings cultivated there. I struggled with myself, and my strict assignment to photograph and post pictures of weeds, as I admired the striking shapes and textures of the native cacti. But I could not allow myself to call them weeds. 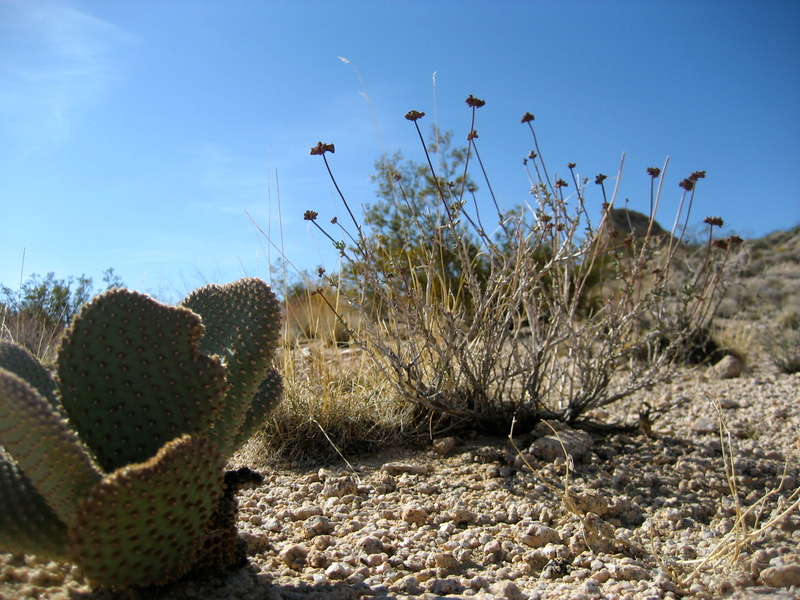 Even if they grow where they are unwanted, their identity is too strong to be anything other than cacti. So I spent a lot of time searching for a “weed” next to a cactus. And here we are…”Prickly and Pretty”. Thank you desert! Please come back tomorrow for a new “Weed Image of the Day” and let me know which ones you like. If my photo inspires within you a story or mood, please share it!